HINCHINBROOK (AUS) (Bay 2007-Stud 2011). 2 wins at 2, AJC Skyline S., Gr.3. Leading Aust. First Season Sire 2014-15. Sire of 271 rnrs, 175 wnrs, 15 SW, inc. Press Statement (BRC JJ Atkins S., Gr.1), Seabrook, Whispering Brook, Derryn, Leonardo da Hinchi, Diamond Tathagata, Beat the Clock, Salsonic, Samara Dancer, Spright, Flippant, Flying Jess, Improvise, Manaya, The Virginian, SP Problem Solver, Wild Heart - Hinchinlove (H.K. ), Knowable, etc. Bluebrook (g. by Hinchinbrook). 3 wins. See below. STRATURBO (Stratum). 9 wins to 1100m, A$569,675, to 2018-19, BRC Chief de Beers H., L, Bribie H., L, GCTC Magic Millions Sprint H., SCTC Angove Wines H., ATC Membership on Sale H., Drummond Golf H., Theraces.com.au H., 2d BRC Bribie H., L, MVRC Tony Beddison Cup, BRC Ascot Green Carnival H., ATC TAB Place Multi H., McGrath Estate Brighton H., Australian Turf Club H.-twice, 3d BRC Sofitel Brisbane Central H.
Hold Your Tongue. 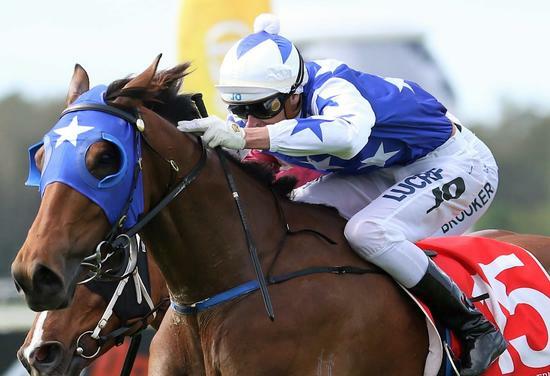 6 wins-1 at 2-to 1400m, A$166,660, to 2017-18, WATC Westspeed 2YO P., Tabtouch Racing & Sports H., Schweppes H., Skyy Vodka H., 2d WATC Westspeed H.-twice, Festival of Perth Racing H., 3d WATC Ascot's Superheroes & Villains Day H., 4th WATC Magic Millions Perth 2YO Classic, RL. CABRON (Mensageiro Alado). 7 wins-3 at 2-from 1000m to 1600m to 2017-18 in Brazil, Taruma Classico Luiz Gurgel do Amaral Valente, L, Classico ABCPCC, L, 2d Cidade Jardim G.P. Presidente Jose Cerquinho Assumpcao, Gr.2, 3d Cidade Jardim G.P. Natal, Gr.3. Race Record: 11 Starts 3-3-0 A$129,640. 3 wins from 1100m to 1600m, A$129,640, in 2017-18, SCTC Cooper Small Construction P., Istyle TV H., 2d Ipswich TC Ray White H.